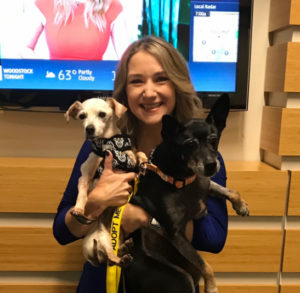 Sampson and Junebug, who joined me on the Weather Channel this past week, are my Pet(s) of the Month! 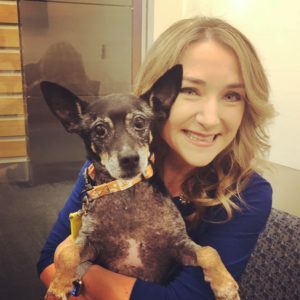 These super sweet senior dogs were the best TV dogs ever! They woke up super early, met lots of new people, and had to wait patiently for their 2 seconds of fame…all in the hopes of finding homes. 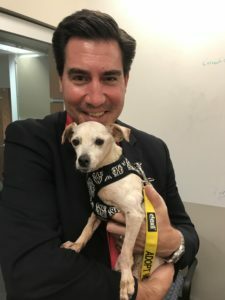 If you are looking for a sweet, well trained companion please consider adopting one or both of these dogs! Sampson is a super spunky senior that ended up at the Fulton County Animal Shelter in Atlanta when his human companion went into a nursing home. In the shelter Sampson lost weight and was not doing well. Thankfully Best Friends of Atlanta rescued Sampson and put him in a loving foster home that nursed him back to health. He is now healthy and ready to find a home to call his own. Sampson loves to cuddle, is house trained, knows basic obedience and enjoys car rides. 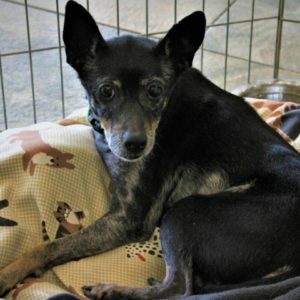 He is also great with other dogs and people, and despite being a senior loves to play. And did I mention he is a TV star! Junebug was picked up as a stray by Dekalb County Animal Services and brought to Best Friends of Atlanta with an Upper Respiratory Infection. He was treated and now that he’s feeling better he loves taking walks but is equally as happy in someone’s arms all day. He is extremely quiet and chill, and just loves to be by his people’s side. He’s also very dog friendly and enjoys meeting new people. He’s a very adaptable and friendly little guy and like his pal Sampson is also a seasoned TV star!